One day has passed since Typhon Jebi tore through western parts of Japan. Efforts are underway to grapple with the devastating aftermath. 11 people died, with hundreds more injured. And a major operation to free thousands of stranded people from a hard-hit airport is still in full swing. About 3,000 people were forced to spend the night at Kansai International Airport after it was flooded by a storm surge. Busses are now shuttling them from the off-shore airport to the mainland by bus. People say it's been a long ordeal. A man in his 50s says, "The long line for the bus makes me more tired." A woman in her 30s says, "My flight was canceled at about 4 or 5 o'clock, so I had to stay at the airport. / But I'm glad to go home." Ferries are also moving people to Kobe. A man in his 40s says "I'm exhausted, but I'm glad to come back safely." A woman in her 30s says, "I had a hard time. I felt anxiety because there was no information, no power, and no food." The airport is still closed with all flights cancelled. Officials say the power is still out in some parts of the main terminal and another facility is flooded. They add it's unclear when the airport will open again. Prime Minister Shinzo Abe has ordered government officials to do all they can to get stranded people out of the airport and to help with efforts to re-open it. Meanwhile, Coast Guard officials are investigating why a fuel tanker slammed into the airport's only link to the mainland. One side of the bridge was completely cut off. The tanker's 11 crew members were rescued. Luckily, no one got hurt in the crash. 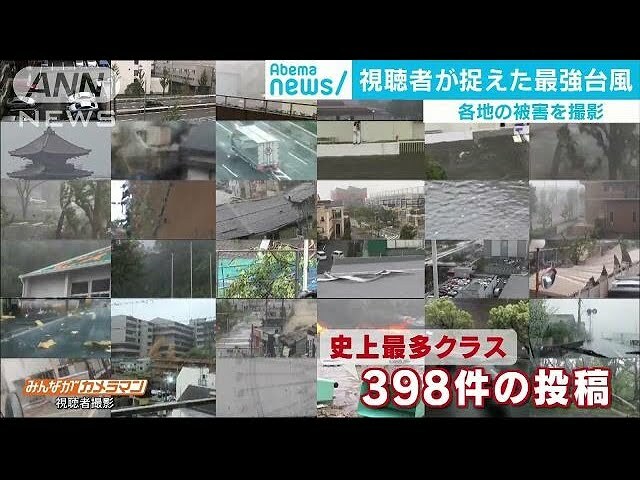 Typhoon Jebi was the strongest storm to hit Japan in a quarter of a century. It overturned cars, ripped roofs off houses and caused widespread damage. It also ravaged a world heritage site in the ancient capital of Kyoto. The roof of a traditional theatre and another national treasure were badly damaged at Nishi-Honganji temple. Officials are still trying to reach people who got trapped by Jebi, including dozens of children who were stranded during a school trip. They were in a mountainous part of Kyoto when the storm downed trees, cutting off their path. Jebi also caused record high tides with storm surges flooding wide areas. In Hyogo prefecture, about 100 cars went up in flames. It's believed sea water reacted with their batteries. Although Jebi caused major disruptions to transportation links, many shinkansen bullet train services are now back to their regular schedules. Some local trains are still experiencing delays. About 2,000 traffic lights stopped working in Osaka.